The NRA America's Rifle Match Presented by Daniel Defense is a marksmanship program designed to develop and test defensive rifle skills with modern, general purpose rifles, such as the AR-15. The AR Match is designed for adults and youngsters of all skill levels, and can be conducted on just about any rifle range in the country. There are categories for Iron Sights, Optics Limited, and Optics Open rifles. Competitors will shoot from a variety of positions, at multiple distances, and will often transition between positions. 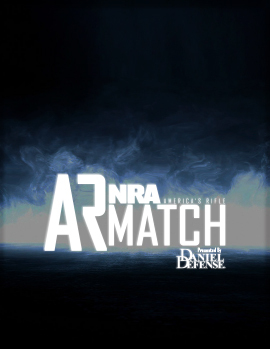 The AR Match is designed so that people can compete with the rifles they have at home for defensive purposes. While the fundamentals of marksmanship are the same as they have ever been, defensive rifle skills and equipment have evolved over time. America's Rifle Matches have been envisioned as the modern-day equivalent of shooting events, that the NRA introduced in the late 19th century, to improve defensive rifle skills as they were understood at the time. This guidebook is intended to provide a starting point to help clubs, ranges, and match sponsors to develop their own events, while accommodating anyone from the novice shooter to the accomplished competitor. The information within the guidebook can be modified to fit the needs of the individual range facility. Those individuals who want to obtain education and training with their AR type rifle before heading to the range for a match may look to the NRA America's Rifle Challenge Guidebook. For questions on hosting a match at your range, courses of fire or sanctioning an NRA-AR Match, contact us at NRA-ARMATCH@nrahq.org or call 703-267-1487.